A Backup is a snapshot of a virtual server disk moved to an off-site location. Backups created with the Freeze filesystem option enabled are marked with a flag icon appended to their status. 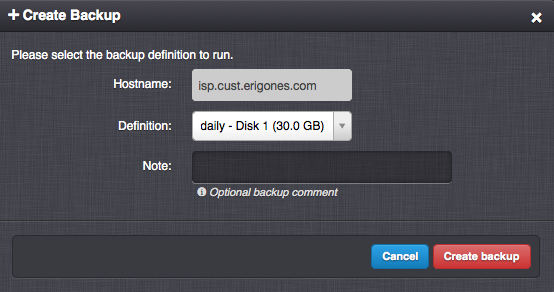 Backup now - Immediately start a backup process based on a backup definition. 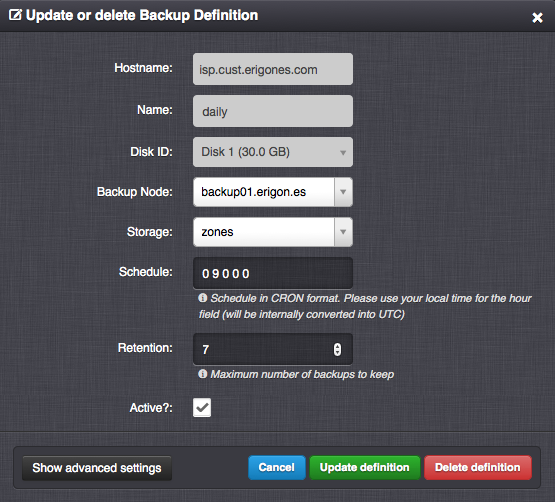 A Backup Definition is a configuration based on which periodic backups are automatically created and deleted. Name - Backup definition name. Dataset - Backups are created by using ZFS datasets in an incremental way (optimal and recommended). File - Backups are created by storing full ZFS datasets into files (can be used to store backups onto remote data storages connected via NFS or Samba). Backup node - Compute node with backup capabilities enabled. Storage - Name of the node storage on the chosen backup node. Retention - Maximum number of backups to keep. After exceeding this number of backups the oldest backup associated with the backup definition will be automatically removed. Active - Whether the backup definition is active. Compression - Compression of File backups. One of: off (no compression), gzip (fast compression), bzip2 (more effective compression). Bandwidth limit - Backup speed limit in bytes per second. Freeze filesystem? - Whether to create application-consistent backups (KVM only). Requires QEMU Guest Agent to be running inside the virtual server.